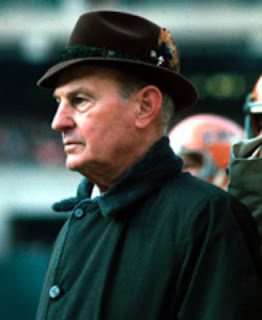 Paul Brown (pictured above) had returned to pro football as a head coach (and GM and part owner) with the expansion Cincinnati Bengals of the AFL in 1968. He had been away from the game after being summarily fired by Cleveland Browns owner Art Modell following the ’62 season, ending a brilliant head coaching stint with the Browns going back to 1946 in the All-America Football Conference that included four AAFC titles and three NFL Championships. The parting had been a bitter one for Brown. The AFL/NFL merger that culminated in 1970 made possible regular season meetings between the Bengals and Browns, particularly since both teams were now members of the new AFC Central Division. Cincinnati won a preseason contest between the clubs, but in their first meeting that counted in the standings the Browns had prevailed at Cleveland in Week 4. Now, on November 15, the clubs faced off once again in Cincinnati. It had been a tough season thus far for the third-year Bengals. They were at 2-6 coming into the rematch with the Browns, having won their opening game before losing six straight contests and then thrashing the Bills the previous week. 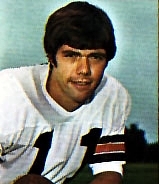 With the loss of their 1969 phenom, QB Greg Cook, to what would prove to be a career-ending shoulder injury, the Bengals were using the weak-armed but intelligent Virgil Carter under center. With the help of offensive assistant Bill Walsh’s redesigned offense that emphasized short passes, and with good mobility, Carter was improving and there was plenty of other promising young talent on the roster. Cleveland, still coached by Brown’s successor Blanton Collier, had gotten off to a 4-2 start but lost its last two games to drop to an even 4-4. First-round rookie QB Mike Phipps out of Purdue was starting his first pro game against Cincinnati, in place of gimpy-kneed veteran Bill Nelsen, and Collier would be calling the plays from the sideline – a practice pioneered by Paul Brown. There was a big crowd of 60,007 in attendance at Riverfront Stadium. The Browns went 77 yards in six plays following the opening kickoff, with the big play a 33-yard Phipps completion to TE Milt Morin. HB Leroy Kelly swept around left end for a nine-yard touchdown. Near the end of the first quarter, an attempted screen pass by Carter to FB Jess Phillips bounced off of the running back’s hand and was ruled a lateral by the officials. Cleveland DT Jerry Sherk picked up the live ball and carried it 15 yards to the Cincinnati 20. A furious Paul Brown complained about the call, but to no avail. Seven plays later, Don Cockroft kicked a 15-yard field goal and the Browns held a 10-0 lead. The turnover on the questionable call seemed to fire up the Bengals, however, and they went 80 yards in eight plays on the ensuing possession. Carter passed to Phillips for a 13-yard touchdown of which there was no doubt. Late in the second quarter Carter took off after rolling out for a 73-yard gain but fumbled at the Cleveland 10 when hit by CB Erich Barnes, who recovered to end the scoring opportunity. The tally remained 10-7 at halftime. In the third quarter, the Bengals put together an eight-play, 85-yard drive. HB Paul Robinson finished it off with a one-yard touchdown carry. Meanwhile, the Bengals defense rose to the occasion and thoroughly bottled up the Cleveland offense during the second half. The Browns were hurt in the fourth quarter when a Phipps pass was intercepted. However, they got a break in the closing minutes when CB Lemar Parrish, while calling for a fair catch, muffed a punt and WR Dave Jones recovered for Cleveland. Four plays later, rather than keeping the ball on the ground and relying on the strong running game, Phipps passed in a fourth-and-three situation at the Cincinnati 30 with less then four minutes remaining in the game. The throw was intended for Morin, but safety Al Coleman batted the ball away at the last second. As an unfortunate side note, Coleman suffered a major knee injury on the play when he fell while tangled with Morin and Parrish. That was the last shot for the Browns as Cincinnati’s offense controlled the ball for the rest of the game. The Bengals came away with a 14-10 win. When the final gun went off, the usually calm Paul Brown leaped up and tossed his hat into the air, running across the field ahead of his players. Cincinnati outgained the Browns (333 yards to 296) although Cleveland had the edge in first downs (15 to 14). In particular, the Bengals outrushed the Browns by 210 yards to 153. However, Cincinnati turned the ball over three times, to one by Cleveland, although the Browns hurt themselves with eight penalties, as opposed to three flags thrown on the home team. QB Virgil Carter (pictured at left) completed 10 of 17 passes for 123 yards and a touchdown with no interceptions and was also the game’s leading rusher with 110 yards on nine carries - the running plays were part of the game plan and came in some typical passing situations. Paul Robinson added 63 yards and a TD on 14 rushing attempts. WR Chip Myers was the team’s top receiver with three catches for 67 yards. MLB Bill Bergey had a noteworthy performance for the Bengals, accounting for 11 tackles, five assists, and a deflected pass. As for the Browns, Mike Phipps was successful on 11 of 25 throws for 170 yards with no TDs and one interception. Leroy Kelly led the running attack with 60 yards on 21 carries that included a touchdown. Milt Morin caught three passes for 78 yards. “This is my best victory. This one made it all worthwhile,” said Paul Brown, who shed tears while congratulating his players afterward. “Errors and penalties hurt us,” summed up Coach Collier for the Browns. Despite their losing record, the Bengals were in the thick of the race in the new AFC Central and would make the most of it the rest of the way. They didn’t lose again during the remainder of the regular season, a total of seven straight wins, and topped the division with an 8-6 record – a big achievement for a third-year expansion team in the pre-free agency era. For the Browns, it was the third straight loss – the first time they had lost that many in a row in 11 years. They ended up placing second to Cincinnati at 7-7 and Blanton Collier retired afterward. Virgil Carter was solid if not spectacular, passing for 1647 yards with nine touchdowns and nine interceptions. He rushed for 246 yards on 34 carries for an average gain of 7.2 yards. The new Ohio rivalry was sealed by the fans. Between the preseason encounter (57,112) and two regular season games (83,520 in Cleveland plus 60,007 for the contest at Riverfront Stadium), attendance totaled 200,639.